After a pizza-carrying rat in New York City’s subway system found fame earlier this year, a Toronto critter is having its own moment in the spotlight after stealthily descending from a coffee-shop ceiling in an artful doughnut heist. After a pizza-carrying rat in New York City's subway system found fame earlier this year, a Toronto critter is having its own moment in the spotlight after stealthily descending from a coffee-shop ceiling in an artful doughnut heist. 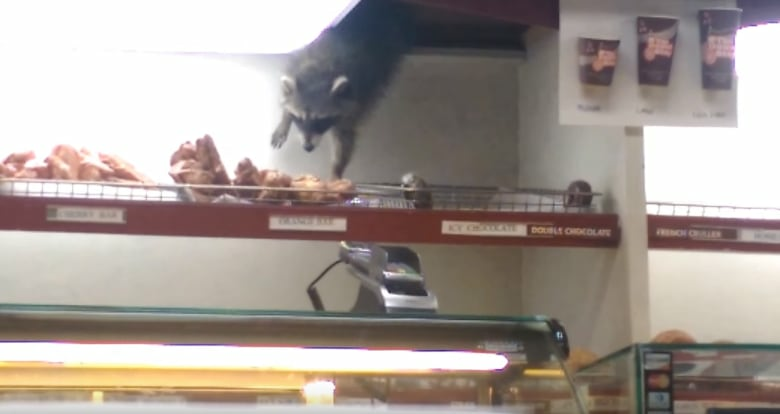 Video of a raccoon that reached down between the shop's ceiling tiles to break into a doughnut case was captured by a Toronto-area man named Peter Jensen, who posted it on YouTube earlier this week. The raccoon is seen carefully balancing itself between the ceiling and the donut case and spending several seconds looking around for a choice snack. Onlookers in the video watched with disbelief, cheering the critter on. "He's doing it. He is doing it," said one. "This is incredible." "Full commitment, full commitment. Go raccoon go!" said another. After a few moments surveying the goods, the raccoon made its selection – orange - and made off back into the ceiling, snack in hand. Jensen aptly titled the YouTube video Sly Cooper and the Thievious Donutus, a reference to the video game Sly Cooper and the Thievius Raccoonus, which stars a bandit raccoon named Sly Cooper and his accomplices, a turtle and hippo, on a quest to recover a book of secret thieving tactics called the Thievius Raccoonus. It's unclear if PizzaRat and Toronto's raccoon bandit will team up to become their own snack-stealing duo.